These Things Shall Pass, a tribute to George Harrison's famous album?, is a five song EP. Schalks delves into music typically not Dutch nor European. His musical heart is in the U.S. on the verge where singer-songwriter and country meet each other and become entwined. In short, the sort of music that was inconceivable to me even to have the idea I would ever come to like; when I had Jasper Schalks' age. Something that slowly changed in the second half of the 90s, mainly through The Walkabouts and then more and more singer-songwriters entered my life from the 00s onwards. 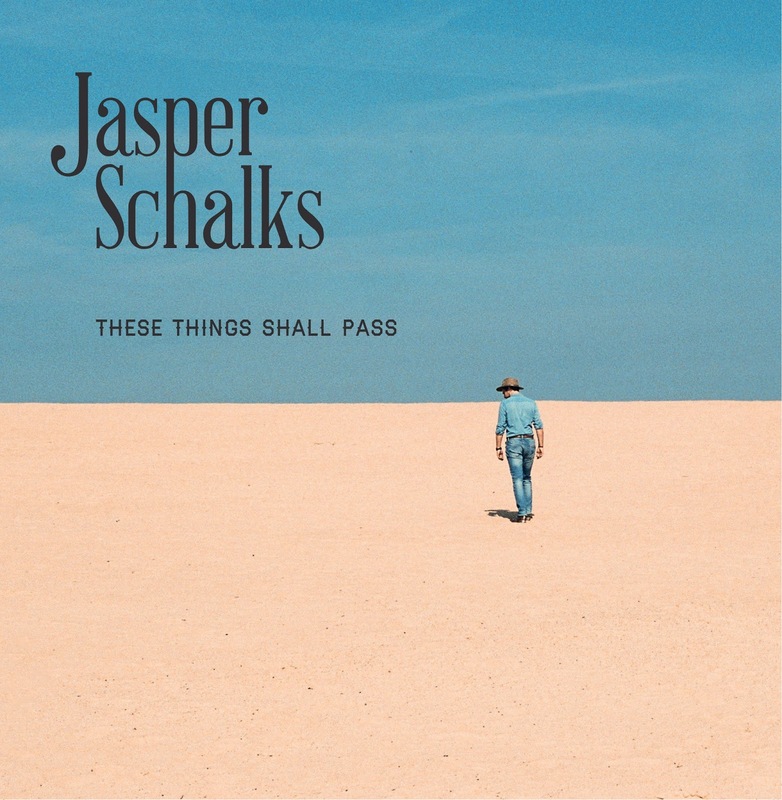 On These Things Shall Pass Jasper Schalks basically does everything right. The songs all have that little something that makes a song like this interesting to listen to. They are far enough away from the traditional country song, while using the same sort of instruments and have that bite that put them in your face.In their own modest way they stand there and demand to be listened to. Eg, 'Goodbye In Advance' is a modest song. The harmonica gives it a Dylan vibe, the melody could be a Glenn Campbell song, yet the guitar solo could have been on a Rolling Stones record where Ronnie Wood is tearing up a Stones' country song. Overall Douwe Bob comes through in this song. So there is a pop element in here as well and all that in one song standing in front of me sending all these little signals: I'm worth your time. And it is. Schalks' voice suits the music he sings. Perhaps it is not 100% perfect, especially when he sings in a lower register. What is does is get the message across and give some flair to the music. The EP is played with a full band behind him, something making the EP very varied. It starts with just an acoustic guitar. A fiddle joins, then a mandolin before the rhythm section comes in with the singing. 'Delicate' is slowly built up with a perfect harmony female voice by Sophie ter Schure in the chorus and second verse. The song in places as delicate as the lyrics that is all about someone being delicate and fragile. 'Delicate' sets the pace for These Things Shall Pass. 'All The Lovers' is even more of a ballad. A slow song for all the lovers and everyone else to enjoy. The fiddle plays a solo (Mirte de Graaff), slow and melancholy. Drawing out the notes, adding to the effect of the song. The Eagles were able to excel in a song like this in the Bernie Leadon days. In 2018 Jasper Schalks carries on the tradition proudly. After 'All The Lovers' the EP makes a turn into a slightly more solid direction with the already mentioned 'Goodbye In Advance'. Electric guitars, including a pedal steel, enter the picture. With 'Anna Please Don't Cry No More' the delicateness returns with the slowest and most delicate song on the EP. It is here that I'm remembered of some of the songs of Rogier Pelgrim. The solid state returns with the final song. 'You Lead Me Home' holds a dark electric sound when a slide guitar joins the whole. Violin and harmonies are a part of the whole again, but this song is darker and I think the best on the EP. Although it is in tough competition with song 2 and 3. I like this different side Jasper Schalks shows and the balance it offers the EP as a whole. The guitar solo played by Leif de Leeuw brings it all back home. 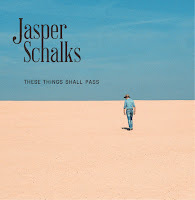 Summing up, These Things Shall Pass is a very nice introduction to this young singer-songwriter from Amsterdam. Live he showed style, charm and played nice songs. On record these songs are fleshed out and made very interesting to listen to in the confines of the home. A welcome addition to my collection this EP is.